What is the first thing you do after waking up? Be honest. I’ll admit that I reach for my smartphone—mostly because it’s my alarm clock, but also to see if Vladimir Putin killed anyone overnight. (I like to check the headlines.) It turns out I’m not alone. 79% of us reach for our phones within 15 minutes of waking, and 62% go for it immediately. Among 18-24 year olds the numbers are even higher. Occasionally I’ll wake to a genuinely important headline or valuable email from a friend, but usually my phone greets me with news stories or photos of my friends on Facebook that really are not very important. For the most part the kind of stuff I see and read first on my phone I can just as easily live without. As I start my normal day, I turn off the alarm, check my email while getting some water boiling for a cup of hot tea, and then when the tea is ready I make my way to “my chair” for a time of prayer and reading the Bible. This is how I plan to start each day but if I’m not careful my phone can get me sidetracked. I will read an email that I need to give an immediate reply and if I’m not careful I will find myself wrapped up in the busyness of starting the day without waiting to hear from God first. Let me encourage you to make every effort to start your day with God instead of your phone. It will take serious effort because the enemy loves to see us sidetracked in other things. This will not be easy but it will be well worth the effort! I want to say, “Thanks” to those of you who prayed for me this week as I officiated and preached my Uncle’s funeral on Monday. My uncle Steve was not a perfect Christian but he did raise three kids who all served God and are active in their local churches. His oldest son Steve Jr. died unexpectedly 8 years ago while working as an associate pastor. His youngest son, my cousin Ryan, is pastoring a church in Missouri. I remember when our church was robbed a couple years ago and my uncle Steve sent a check to help us replace the equipment that was stolen. That is the kind of generous heart he had for God’s work. How far would you go to defend your belief in God? 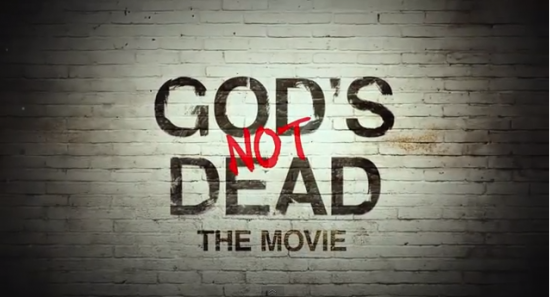 Find out college student Josh Wheaton’s answer to that question in God’s Not Dead at our free movie night this Sunday, August 17th, at 6:30 p.m. in the sanctuary. God’s Not Dead (rated PG) weaves together multiple stories of faith, doubt and disbelief, culminating in a dramatic call to action. The film will educate, entertain, and inspire moviegoers to explore what they really believe about God, igniting important conversations and life-changing decisions. We will have a time of fellowship with cookies in the Fellowship Hall following the movie. If anyone would like to brings some cookies to share that would be great. Please let one of the Stewards know: Faith Shimko, Carmen Vargas or Lucy Vargas. Pastor James and Judy had a new grandbaby August 9th...a boy Ziggy Alexander Davies 8.5 lbs and 21 inches. Heather and baby are good. Congratulations Pastor Grandpa and Grandma Boggs! Anna, and Sarah will be going back to Olathe to attend our regional school we support as a church, MidAmerica Nazarene University. Anna and Sarah plan to continue pursuing their degree in nursing. We will miss the twins and their work in children’s church and with the youth department. We are always looking for volunteers and maybe there is someone who may want to help fill their spots on the schedule. I look forward to seeing you in Worship this Sunday and don’t forget the movie night and to bring a friend.